The British elite are in denial about its rejection by voters in England. All the arguments made to challenge the Brexit result are bogus. The rage and fury of the pro-EU camp in Britain has been a wonder to behold at a result that they never imagined. One of their particular refrains is that the British people were deceived by the Leave camp into voting to leave the EU. Is there any truth to this claim? The short answer is that plenty of lies were told during the referendum campaign. Like every election that is ever fought it was characterised by exaggerated claims, personal abuse and hyperbole. Though any view on such an issue must be subjective my view is that the referendum campaign was no worse – and the lies told during it no more and no greater – than in any other British election. Moreover both sides said lies and my again necessarily subjective impression is that neither side said more lies than the other. The Leave campaign undoubtedly did say things which were untrue. The claim Britain could negotiate effortlessly an arrangement with the EU whereby it could quit the EU but remain a part of the EU’s single market whilst simultaneously imposing immigration controls was a fantasy. It was however a fantasy that was repeatedly exposed by the Remain campaign during the referendum campaign. Moreover the Remain camp had the help in doing so of most of the media and of the US and of EU leaderships – including people like Angela Merkel whose comments on such a question would normally be considered authoritative. To imply that this bogus claim swung voters as if it went unchallenged is nonsense. What is often overlooked is that the Remain also told its share of lies. Not only did it predict economic Armageddon in the immediate aftermath of a Leave vote – of which there is no sign – but it also repeatedly and constantly accused the Leave camp of carrying out the sinister agenda of Vladimir Putin. Moreover it persisted in doing so even after the Russian embassy complained about it. Indeed some members of the Remain camp sometimes gave the impression that for them the need to thwart the evil plans of Putin was the single most important reason to vote Remain (see for example here and here). Prime Minister Cameron – the erstwhile leader of the Remain campaign – shamelessly played up this trope, disgracefully lumping Putin with Daesh as the twin supporters of Leave. The argument was taken to such fantastical lengths that articles even started to appear – admittedly more in the US than in Britain – saying Putin’s silence on the Brexit question was part of his cunning plan to improve the prospects for a Leave vote. At one point there were even claims – made in all apparent seriousness by David Cameron no less – which (though quickly retracted) claimed that Britain quitting the EU would set the scene for World War 3 – presumably by encouraging Russian “aggression”. In my opinion the referendum campaign – like most election campaigns at least in Britain – made little difference to the eventual outcome. I strongly doubt working class voters in the north east of England who voted Leave were at all interested in the question of whether or not Britain would be able to negotiate access to the single European market – a technical issue that would have gone completely over their heads. Whether or not I am right about that, they were all too obviously not interested or in the least impressed by all the flesh-creeping talk about Putin and his sinister plans or about the dangers of World War 3. As it happens I suspect Putin commands far more respect amongst British voters of every class than the elite in London realises, and I doubt the parading of the Russian scarecrow changed a single vote. The truth is that British attitudes to the EU became settled long ago and the vast majority of British voters decided how they would vote long before the referendum campaign began. For the record I should also say that I think Boris Johnson’s contribution in getting British voters to vote for Leave was minimal. Claims – some of them borderline hysterical – that he swung the advantage to the Leave camp and that Britain voted Leave because of him, are frankly farfetched and ignore how confused and uncertain his leadership of the Leave camp actually was. The truth about Johnson’s role is that it was a case of a cynical and opportunist politician trying to ride a wave the size of which he completely underestimated, and certainly not of his creating that wave. There is good reason to be angry with Johnson for his abdication of responsibility in the days immediately following the announcement of the referendum result (see my comments here and here) but to blame or credit him for the result itself is ridiculous. There is a continuing refusal to understand the Brexit vote and a continued denial about it. It is misleading to call it close. Across the United Kingdom as a whole the Leave vote won by a clear margin. That however actually understates the issue. 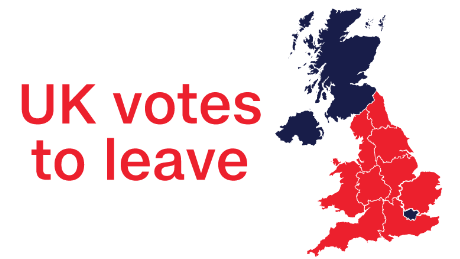 Outside Scotland and Northern Ireland – which have their own particular cultures and histories and which had strong reasons of their own to vote Remain – England outside the metropolitan centre of London voted overwhelmingly on a high turnout to leave the EU with the Leave campaign winning in every single region of England and Wales. By not facing this fact, by instead chasing around for scapegoats (Cameron, Corbyn, Johnson etc), by refighting a referendum campaign in op-eds and editorial pages after it is lost, and by cooking up elaborate strategies designed to nullify or set aside the result of a democratic vote, the Remain camp and the British political elite are closing their eyes to the fact that their case for Britain staying in the EU was utterly rejected by the people of England, the core population of the United Kingdom without whose support it cannot exist. This is to play with fire, creating a distance between the elite in London and the people of England which has not existed since the start of democratic politics in Britain in the 1920s, and arguably not since the civil war of the 1640s. It is a cliche that an elite begins to lose its way and its legitimacy not so much when it runs out of answers to questions but when it is no longer capable of even seeing the questions. As of today Britain’s elite is dangerously close to that point.